We’ve already written about home office and the (dis)advantages of it, as well as about staying organized when working in a flexible working environment with no set working hours or no set place that you should be working from. This time around, we’d like to dive into remote work a bit more. Into why we think it’s a beneficial thing for Sleighdogs, and what is The Pack’s experience with working from anywhere but the office. First off, let’s lay out our basis here. When we’re talking about remote work, what we mean is… yep, exactly what you’d guess – working not from the office. It might perhaps even mean not from the same city as where your company is based. Possibly not even from the same country. Space travel is not much of a thing yet, but soon, we’re pretty sure we’ll be able to work remotely from up there as well. And we’ll be all up for it! What’s our thinking behind it? Sleighdogs embrace remote work because we trust The Pack to know how, when, and where from they can work the best. Focusing on results, not on 9-5 office time. We are keen to experiment and let all Sleighdogs experiment as well – our idea of the future of work isn’t just enhanced by technology but also a lot more fitted to human needs. We realized that if we want to enter the innovation game, we need the most innovative people on board. And those are people who are also innovative in the way they work. Plus, we’ve never been huge fans of borders. They’re so… limiting. We’d much rather challenge the status quo and see if we can do better than that. Remote work, aside from the fact that it allows for a much more people-centered approach to work, has many other benefits – for both the employee and the company. First off, as an employer, you can cut down on office space if some or even most of your employees work remotely. That’s a potential great reduction to your monthly costs. Remote work can also be a lot more eco-friendly, reducing your company’s carbon footprint with fewer people commuting into the office on a daily basis. What’s more, opening your company up to remote workers means a much bigger talent pool to choose your team players from. For employees, remote work can bring about a better work and life balance, more flexibility, and possibly, if you know how to work around your biorhythm the best, also higher productivity and less stress. 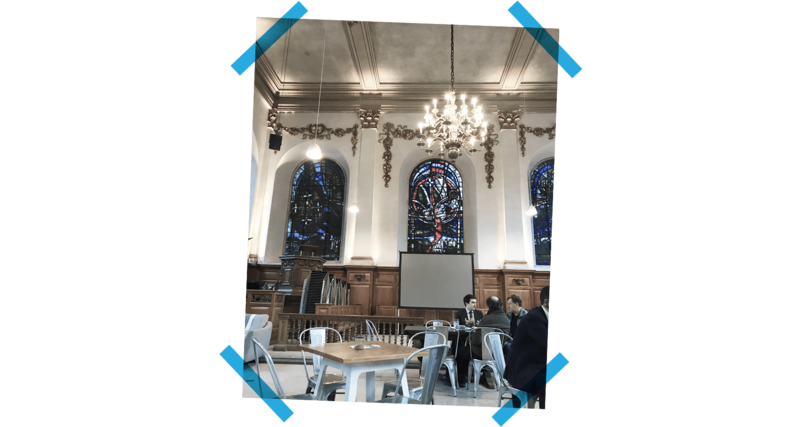 An old church converted into a co-working cafe, London, UK. We have Pack members who work remotely pretty much a 100% of the time. However, for most of Sleighdogs, remote work is a perk that they enjoy from time to time, to various extents. Some of us have also, at some point, done what’s now commonly referred to as “digital nomadism”, working from, quite literally, all over the place. The Czech Republic, Indonesia, Denmark, Ireland, Germany, The US, Italy, Sweden, Portugal, England… You name it, chances are one of us worked from there at some point. The flexibility that comes with remote work is the most appreciated benefit of it, according to Sleighdogs. In a company as international as Sleighdogs, being able to work from abroad a few weeks or months a year means that we can spend time with our friends and families, even if we otherwise live far from them. That’s comforting, helps our psyche, and gives us a better life and work balance. For some of us, remote work is something we enjoy and use as a way that conveniently interconnects work and exploring the world. It’s a privilege that allows us to fully experiment with where, how, and when our minds focus the best. It can also help us learn more about ourselves and, eventually, grow to be completely comfortable with just being on our own. That in itself is a pretty useful life skill to have. However, for some of us, for example Jonas, our co-founder, who works from our office in Berlin and comes to Prague, where our HQ is, about once a month, remote work is more of a necessity. 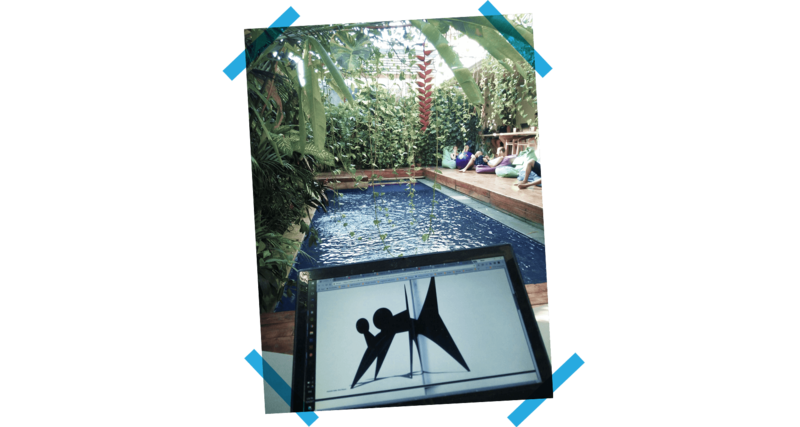 Poolside working setup, Dojo, Bali. Just like anything else, the remote work coin also has two sides to it. Most importantly, remote work is not a setup that works for everyone. Not for every company, not for every employee. We find that the ultimate step towards making it work is mutual trust. If everyone within The Pack trust each other, there’s no reason for remote work to not… work. It means, though, that you have to pay close attention to who exactly you’re bringing into your team. Can you trust the person? Do they share the same mindset? Do they have the self-organization and self-discipline needed to be able to work productively without anyone keeping a close eye on them? Ask yourself (and your candidate) those questions so that you’re not caught by surprise later on. The trickiest part of it? What’s more, while working remotely and being location independent, you are, on the contrary, much more technology dependent. Because Slack and Zoom are often your only ways to keep in touch with the rest of the team. That’s why a solid, stable Internet connection is the number one must-have for a good spurt of remote work. And then there is communication. Some things are best said face to face. When you can’t do that, misunderstandings may happen. You might also find yourself missing the emotional connection with your colleagues, the shared routines, the lunch breaks, and the coffee machine chitchats. For managers, this is even more crucial. “As a manager, while working remotely, I can’t just come into the office every single day in a good mood and motivate my colleagues that way. I need to get creative and be all the more expressive in written – or audio/video – communication,” says Jonas. Ultimately, though, as a company, we feel that the biggest challenge is that a more flexible approach to work isn’t yet the norm. That’s why we’re so vocal about it and always trying to show the world that different might actually often equal better. 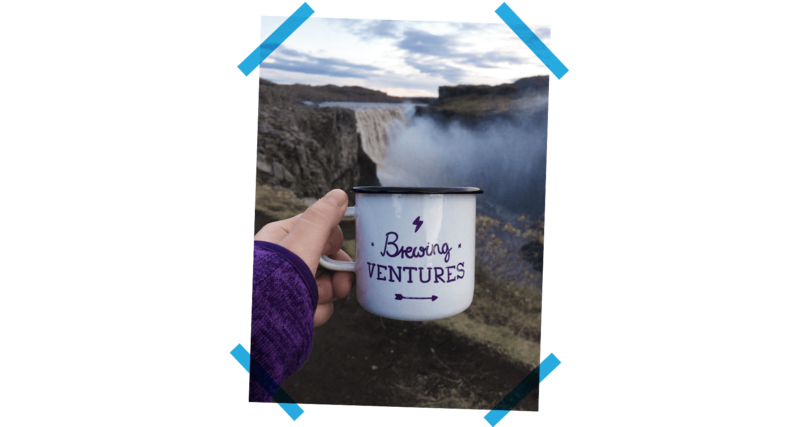 A coffee break in Iceland. 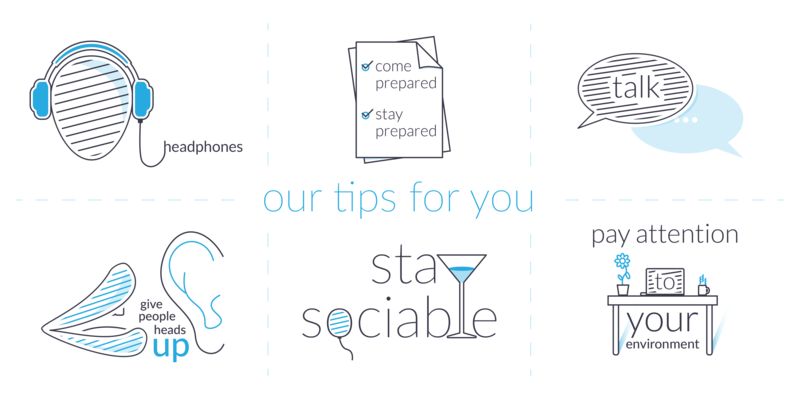 Finally, we’ve put together a handful of tips and tricks for you. Things that we feel can make remote work more productive and more enjoyable. Headphones – Yes, we always say this. But really, it can’t be stressed enough. A pair of good, noise-canceling headphones can go a long way! If you’re working from a busy, noisy, crowded, not really that well (or not at all) air-conditioned Indonesian airport, your headphones might be your only source of solace. True story, as empirically tested by Maroš, one of our devs. Talk, talk, talk! – Make sure you communicate with your colleagues. Communicate with them even more than you would if you were in the office with them. Don’t just stick to work-related topics either. You can get to know your team even if you don’t sit next to each other every single day. Give people heads up – We’ve developed a habit of always letting people know beforehand what our working arrangement for the day is. Let your colleagues know where you’re working from and when you’re going to be available to talk. It takes five seconds but makes a world of difference. Pay attention to your environment – You won’t be able to focus if you’re uncomfortable. And that goes for noise levels, cleanliness, general ambiance as well as the amount of distractions around you. Even things like how good your chair for the day is matter. Don’t suffer through discomfort – reshuffle, move seats, move places, move countries… just get comfortable. What’s your opinion on remote work? Have you done it? Do you regularly do it? If you’re an entrepreneur, do you allow for it in your company? Why? Why not? Drop us a line or Tweet us! The Telegraph: Would you be happier if you worked remotely? 15 Five, David Hassell: Is remote work right for your company?